The autumn festival is held around the first weekend of September 2017 in the City Park (Városliget), Napozórét/Great Meadow next to Petőfi Stadium the largest leisure park in the city near Heroes’ Square, (M1/yellow line). Great beers and food at scenic locations! Admission: free, but for beer beer tasting you have to buy a Craft Master Two tasting glass with the logo of the festival, sold on the spot in size 0.5 L but with markings of 0.2 L, 0,3 L, 0,4 L and 0,5 L. Price of the glass: 1 250 HUF. The September event had been focusing on red beers. Payment on the festival: with HelloPay card and paypass bank cards (no cash). TIP: If you cannot visit the Festival try our Craft Beer Cruise Budapest program where you’ll sample 5 of the best local specialty beers (Keserű Méz, Fóti Zwickl by the Fóti Craft Brewery, Rizmajer Wheat Beer, Flying Rabbit IPA by Monyo, Horizont Flamand Porter OR Stari Blackcurrant). Each sample is 150 ml. At the end you can choose one to have a full pint for FREE. A 2-hour river tour + snacks + live Gypsy music for 27 EUR! The most popular participants of previous events will be present again along with new stars of Budapest’s street food scene. Zing Burger – The truck’s main location at Király utca 60., and their food truck is in Gozsdu Court. The juiciest burgers packed with goodies: Cheddar cheese, braised onion, Philadelphia cream cheese, bacon, chilly. Try the Guitar Hero, or the Phily Burger. Piknik Utczabár – bistro food, premium quality wines, homemade fruit syrups, smoothies. 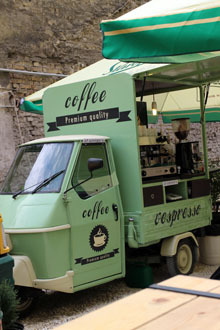 Vespresso Coffees – the green retro Vespa offers quality coffee made from relatively freshly roasted beans supplied by the British Has Bean. When not on a festival they can been found in the Karaván Street Food Court at Kazinczy utca 18., district VII. TIP: The Gourmet Festival (17-20. May 2018.) is also a great place to try local food. The cream-of-the-crop of restaurants from Budapest and other parts of Hungary will be present and offer a taste of their cuisine over the 4-day event in Millenáris Park, Buda. You can sample more than 100 beers in 50 stalls made by the cream-of-the-crop artisan Hungarian breweries. Lighter ales and lagers are becoming more and more popular, while Indian Pale Ales are still well loved at any beer event. The curiosity of the season will be the hopped ciders: you can compare two: the Fusion Cider of OK Brewery and The Infusion by Hopfanatic. Zip will tap Black IPA, East India Pale Ale, and saison. Summer Pale Ale – by Ogre and Armando from Békésszentandrás. Bretania – Hungary’s first sour ale also by Legenda. Well-known craft breweries that are longtime participants of Főzdefeszt that will be in the City Park. You can also sip brews made in Transylvania. The guerilla beer makers will surely bring some exciting beers too. TIP: Don’t miss the Belgian Beer Festival in Budapest Whale/Bálna in mid-May: nearly 200 beers, 50 on tap. The Czech Beer Festival is held in June on the roof terrace of WestEnd in downtown. 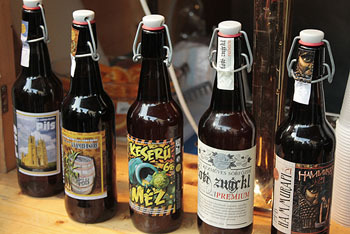 See information on other beer festivals in Budapest. Andrássy Avenue – grand palaces, museums, glitzy shops, restaurants, cafes line this Parisian boulevard in the city centre. Opera House – an imposing building on Andrássy Blvd. built in the second half of the 19. century. St. Stephen’s Basilica – home to King St. Stephen’s Holy Right hand, organ concerts and a superb view form the cupola. Miniversum – large model layout of railways, cities, countryside, attractions of Hungary, Austria and Germany.